Congratulations to Curtis Newton, Donnie Egerter, Kyle Fraser and Tristan Doughlin on being named to the West team for next month’s East West Bowl. A’dre Fraser was also honoured with an invite but he will not be playing in the game as he continues to rehab an injury. OTTAWA (CIS) – Canadian Interuniversity Sport announced Monday the rosters for the 13th annual East West Bowl. The 2015 CIS football prospects game is set for Saturday, May 9 at 7 p.m. at McGill University’s Percival Molson Memorial Stadium in Montreal. McGill will host the event for the first time, taking over from Western University, which hosted the last six editions in London, Ont. 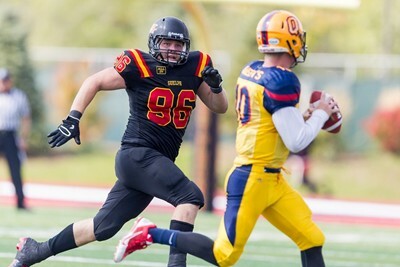 Guelph, ON – A total of four Gryphon football players will head to Montreal in early May for the 13th Annual CIS East-West Bowl. The East-West Bowl is organized by the Canadian University Football Coaches Association and showcases CIS players who are eligible for the CFL Canadian Draft the following year (2016). Second Team All-Canadian linebacker Curtis Newton and OUA First Team All-Star free safety Tristan Doughlin will be joined by a pair of talented linemen in defensive tackle Donnie Egerter and offensive tackle Kyle Fraser-Audit. All four players will be entering their fourth year of eligibility with the Gryphons when Week 1 of the 2015 regular season kicks off on Sunday, August 30th against the Waterloo Warriors. It would seem that the selection process for the East-West Bowl continues to evolve. Every school no longer automatically has 3 players on the team. Each school now submits a list of six players they nominate. A committee of CIS coaches and CFL representatives review the nominations and determine who gets invited. It is necessary to select appropriate numbers of players at various positions to field two teams. But CFL teams may be primarily interested in ensuring that they have an opportunity to look at the players they think are most likely to be CFL prospects. In my opinion the fact that five Gryphons received invites says something positive about the talent on our roster. All five of the invitees were members of the 2012 recruiting class. Participating in the week long activities is much more important than just the game. Some of the coaching comes directly from CFL coaches and all of it comes under the watchful eyes of CFL player personnel people, coaches and executives. The combine is a dry run for players who hope to receive invites to CFL combines next spring. While Fraser is missing an opportunity to impress CFL scouts that could well work to his benefit. No doubt CFL teams are already aware of the talent the former Team Canada player and 3-time All Star possesses. If S&C Coach Jordan Foley and Athletic Therapist Teresa Hussey think Fraser is better off sitting out of East-West activities, then so be it. Fraser’s CFL chances will be far better served by having an injury-free 2015 season than anything he could do next month in Montreal. With assistance from several alumni, last year I compiled this list of Gryphon players who have participated in previous East-West Bowls. This entry was posted in Uncategorized and tagged East-West Bowl. Bookmark the permalink.